From summer weddings to afternoons at the Renaissance fair, there's no accessory that beats the beauty and timeless appeal of a flower crown. Fortunately, this stunning hair decorations is easy to create yourself, whether you use fresh flowers or artificial blooms. If you use fresh flowers to create your flower tiara, you'll need to make sure you keep the blooms refrigerated before and after the project. With proper care, your fresh flower hair piece should last about one day. Alternatively, you can use quality silk flowers to make this hair decoration. Since the project will take you about an hour to complete, this may be the best use of your time if you plan to wear the wreath more than once. 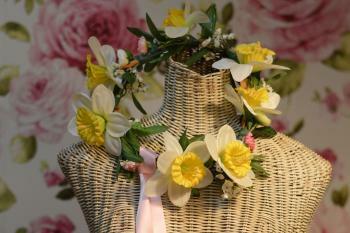 Start by wrapping the florist's wire around your head where you want the crown to sit. Mark the length of the wire with your fingers and then triple that length. 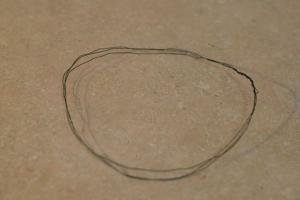 Form the triple length of wire into a circle, twisting the ends together to secure them. Make sure any sharp ends are buried between other layers of wire. Cut another piece of wire about 24 inches in length. Wrap this piece around the triple circlet you created in step 1. This will secure the three wires together and make a good base for attaching the flowers. 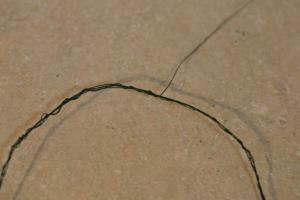 Trim the ends of this wire and make sure they are not sticking out. 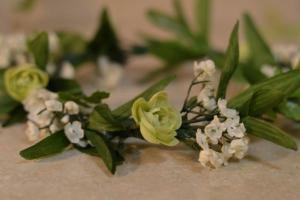 Cut small stems of greenery and white flowers, each about four to six inches in length. You'll need enough of these stems to go around the crown two times. Tear off a four-inch piece of florist's tape and use it to secure the first stem to the wire crown. Secure it in at least two places. Follow with another stem, slightly overlapping the first. When you've gone all the way around the crown, add a second layer to create the fullness you need. 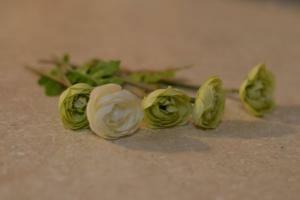 Cut a few short stems of your simplest flower. It's important to use an odd number of each flower to create visual balance in the flower crown. 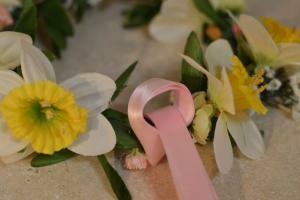 Use florist's tape to attach these flowers to the wreath. Wrap the stems just behind the head of the flower and then again to cover the cut end. Make sure each flower is facing out. Choose another small flower that is a bright shade. This will add a pop of color throughout the wreath without being overpowering. Cut an odd number of blooms and attach them in the same way. Finally, choose your statement flower. 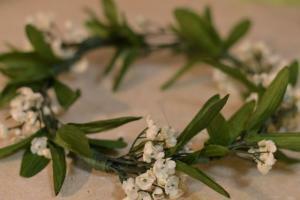 Attach an odd number of this flower to the crown using the florist's tape. Make sure all the flowers are pointing in the same direction and facing out. Cut at least three pieces of ribbon in varying lengths. Stack the pieces together and fold in half at the middle. Loop the ribbon around the wreath and pull the ribbon ends through the loop. The ribbons will trail down through your hair. You can add more ribbon if you like, depending on the look you have in mind. For a foolproof flower combo, choose seven large blooms, five small, bright flowers in a different color, and five simple white flowers. Add lots of tiny white flowers and greenery. If you find that you have bare spots in your crown when you are done adding flowers, use some greenery to fill in those areas. Unless you want the look of a wildflower wreath, stick with two colors in addition to white and green. Your ribbon should match one of those colors. 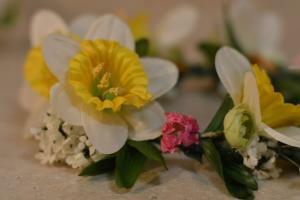 If the blooms are especially heavy, attach them to the crown with wire before you wrap them in florist's tape. This will reinforce the structure of the crown and make sure it is sturdy enough to stand up to wear. To wear your flower tiara, use bobby pins to attach it to your hair. Flower crowns make adorable dress-up accessories for little girls and stunning hair decorations for brides, beauty queens, and anyone who wants to look fresh and beautiful. No matter what the occasion, you'll turn heads when you wear a floral crown you created yourself.